Compete says that, on an average, a unique visitor to Google Docs logs in to his/her account just on 3 days per month. 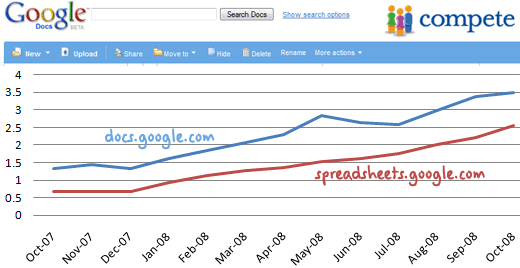 And the overall engagement level is even worse because an average visitor is spending just about 5 minutes per month on the Google Docs site.�This graph, using data from�Compete, gives a good idea about the growing popularity of Google Docs office suite at least among Internet users in the US. According to Compete, Google Docs had around 4.4 million unique visitors in September with docs.google.com attracting nearly twice as many unique users as spreadsheets.google.com on average. This is obvious because Google uses the docs.google.com to host both their word processor as well the presentation program while spreadsheets.google.com is exclusively used for hosting Google Spreadsheets. Though Google Docs seems to have a really large user base, the average time that people spend on Google Docs is pretty low. Compete says that, on an average, a unique visitor to Google Docs logs in to his/her account just on 3 days per month. And the overall engagement level is even worse because an average visitor is spending just about 5 minutes per month on the Google Docs site. Thanks Steve.